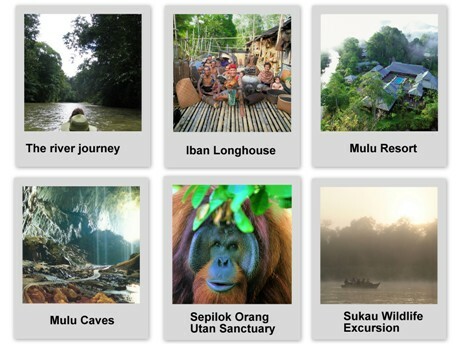 The tour that takes you to deep interior of Borneo in the long house tours and Mulu Caves plus the Kinabatangan basin to discover the wildlife – Prosboscis Monkeys. There is plenty to see as you travel across from Kuching to Mulu followed by Kota Kinabalu where you end in Sandakan/Sukau in this journey. 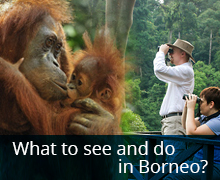 This is a soft adventure programme in Borneo suitable for everyone. A 225-km car/coach journey takes you through lush green countryside dotted with padi fields, pepper gardens and rubber plantations, and flanked by rugged jungle-clad mountains. Along the way, stop off at the Serian farmer’s market, visit a pepper garden and view carnivorous pitcher plants. Stop for lunch at a roadside bazaar deep in Iban country. Arrive at Lemanak jetty mid-afternoon for a longboat ride up the Lemanak River, passing through typical Borneo countryside with an ancient longhouse tucked behind almost every bend in the river. Arrive at either Serubah or Nanga Kesit Longhouse and visit the “entire village under one roof.” Tour the longhouse and enjoy a demonstration of blowpipe shooting. Return down river for transfer to Batang Ai jetty. After a 20 minutes boat ride across the 24sq km Batang Ai Hydro Lake, arrive at the Aiman Batang Ai Resort & Retreat. Breakfast at the resort. Enjoy the view of the lake – it is sometimes shrouded in mist which makes it quite breathtaking. Depart for Kuching via the same route. Lunch is served en route.Drop off at hotel in Kuching for overnight. Take the early morning flight to Miri via MH 2802 (0700/0800) and connect to Mulu via MH 3630 (0920/0950). On arrival, transfer to Mulu Marriott Resort & Spa.In the afternoon, depart for 3-km plankwalk to visit Deer & Lang caves and wait for bat exit at the observatory before returning late evening to resort for overnight. After breakfast, depart by longboat journey for short stopover at penan settlement (semi nomadic tribe of Sarawak) before continuing on to Wind & Clearwater caves. Return to resort at mid afternoon.Rest of the day – relax in this unique resort by the pool or indulge yourself in the Spa or Massage treatment. Transfer to airport for flight to Miri to connect to Kota Kinabalu via MH 3254 (1440/1625). On arrival, meet & transfer to hotel in Kota Kinabalu. Full Day Kinabalu Park & Poring HotspringNominated by UNESCO as a World Heritage, Kinabalu Park is one of the most biologically diverse areas in the world. Here, Mt. Kinabalu, the highest mountain in Malaysia towers majestically at 4095 m (13431 feet). From the montane oak-chestnut forest proceed to the lowland dipterocarp forest at Poring. Cross a Canopy walkway to view epiphytes growing on the treetops. If time permits, you will be able to take a dip at the Hot Springs where the sulfuric content of the natural springs are said to have therapeutic value. Depart Kota Kinabalu via MH 2042 (0700)/0700) to Sandakan. Upon arrival, meet & transfer to the world’s largest – Sepilok Orang Utan Rehabilitation Centre. The orphaned orang utans from logging sites, plantations and illegal hunting are rehabilitated before being released into the wild. See the primates being fed by the park wardens plus a video show. After lunch, embark on a 2-hour boat journey to Sukau Lodge along Sabah’s longest river, Kinabatangan. The journey takes you through the mangrove, wetland and rainforest habitats with a good chance of wildlife sightings. Note : Accommodation at Sukau Lodge is simple yet comfortable with modern amenities in room with electric fan & solar heated water. After breakfast, return to Sandakan by boat journey and transfer to airport for flight MH2047 (1400/1445) – daily flight to Kota Kinabalu. Note : Visit the Sandakan War Memorial – The Memorial Park is on the site of the Sandakan prisoner of war camp can be included for late afternoon flight departure – surcharge applies.